I just bought half a hog from a local farmer and one of the cuts I requested was pork belly. This is one of the most succulent cuts of a pig and very hard to find unless you special order it. I had never prepared it, but have eaten it at a local restaurant called The Stumbling Goat. Yes, this cut is pretty fatty, but remember that fat is what gives meat such great flavor. Plus, it’s not like I’m eating it every day. So, with a purpose to find a recipe on preparing pork belly, I searched the web and found a fantastic recipe from Maker’s Mark, who produces bourbon. I didn’t spend the money on their brand of bourbon – the cheap stuff I had on hand worked just as well. 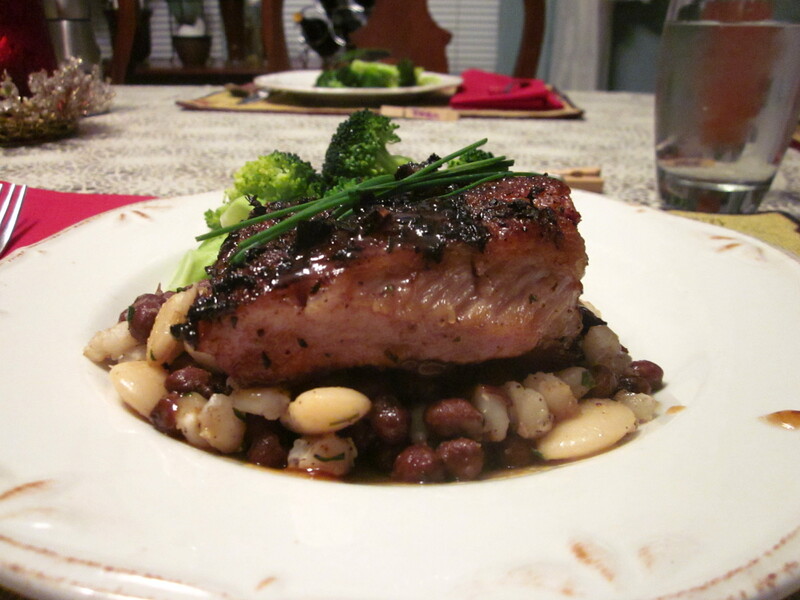 The meat is placed upon a medley of butter beans, crowder peas and hominy and really complimented the taste of the pork. Below is the recipe – and it was really pretty simple to make. Using a sharp knife score the skin of the pork belly in a checkerboard design. In a bowl combine the salt, pepper, sage, thyme and garlic. Rub the pork belly on both sides with mixture until evenly coated. Place pork belly in a roasting pan skin side up. Place in the oven and bake for 3-1/2 hours, turn oven to broil and cook for 10-12 minutes until the skin puffs up evenly. Remove from oven and let rest for 30-40 minutes at room temperature. Using a serrated knife, cut the meat into 1/2-inch-thick pieces and reserve. Place the honey, bourbon, vinegar, butter, salt and pepper in a large sauté pan. Place over medium high heat and reduce by a third. Place the pieces of crispy pork belly in the pan and increase to high heat. Cook until the bourbon is syrupy and glazes the pork belly. Remove from heat and keep warm. Place a small pile of succotash in the middle of a plate. Place the pork belly on top of the succotash. Nape the pork belly with the bourbon glaze and drizzle some of it around the plate. *Note: You can substitute canned beans if you cannot find fresh beans, and skip steps 1 and 2. Rinse the beans and hominy in a strainer to get rid of the can sediment. Mix the beans and the hominy together. With a sauté pan over medium high heat, add the butter until melted, add the hominy mixture and cook until hot. Add the chives, salt and pepper. Incorporate evenly, taste and adjust seasoning if needed. Update: I’m starting to see pork belly in more grocery stores – it seems to becoming more popular and usually called a side of pork.